The efficiency of the inverter drives the efficiency of a solar panel system because inverters convert Direct Current (DC) (as produced by the solar panels), into Alternating Current (AC) (as used by the electric grid). This leads many to wonder what effect over-sizing or under-sizing an inverter will have on overall system efficiency. This entry sheds some light on this issue, hopefully helping shoppers to make better decisions with regard to their current or future solar photovoltaic installation. A solar system’s inverter functions optimally within a predetermined operational ‘window’ (usually laid out in the inverter’s specifications). As the power input from the system’s solar panels goes up and down, the inverter’s ability to efficiently convert it from DC electricity to AC electricity differs. As long as the input from the panels falls with in the range of the window, the inverter can be considered to be operating optimally. In the graph below, the red line represents an average inverter efficiency and the green arrow represents the power output from your solar panels. The grey box shows the operational window of the inverter based on the input from the solar panels and the predetermined efficiency of the inverter. In this case, an efficiency of less than about 83% would be considered ‘sub-optimal’, and ideally the system should be sized to minimise the amount of time during the day that the inverter operates within this range. 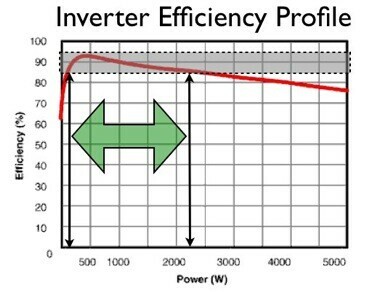 Using the graph above as an example, under-sizing your inverter will mean that the maximum power output of your system (in kilowatts – kW) will be dictated by the size of your inverter. Regardless of the output of the solar panels, the power output will be cut-off (‘clipped’) by the inverter so that it does not exceed the inverter’s rated capacity (e.g. 3kW, 5kW etc). Your installer may suggest an undersized inverter if they determine that the amount of incident solar irradiation (sunlight) on your panels will be lower than expected – because of your location & climate, the orientation of your panels, or other factors. Although the maximium power output of a solar system will be ‘clipped’ back to the inverter’s output through overclocking, there can also be gains in the overall amount of energy (kilowatt-hours – kWh) generated (see: ‘Power, energy or capacity?‘) – and slightly more energy produced in the early morning and late afternoon. 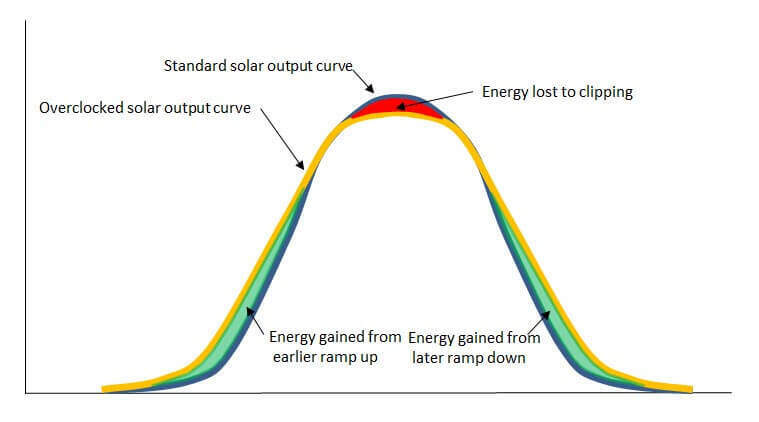 The chart below offers an illustration of how the midday losses (red) associated with an ‘under-sized’ inverter can be offset by morning and afternoon gains (green). Installing an inverter whose maximum capacity is greater than the nominal capacity of your solar panel array may be an option if you’re looking to expand your solar panel array at some point in the future, but it is not generally recommended, as the overall energy yields from your solar system may be lower than with a perfectly-sized or under-sized inverter – especially if it is significantly oversized. Although inverters are generally designed to handle lower power inputs than their nominal capacity, there are limits to this. It’s therefore important to ask your installer questions about how your system will perform in the even that an over-sized inverter is suggested – e.g. how would your overall energy yields differ over the next 5-10 years with an over-sized inverter vs a ‘right-sized’ or under-sized inverter? Balance this against the cost of the various system configurations before making your final decision. Solar inverter under-sizing (or solar panel array oversizing) has a become common practice in Australia, and is generally preferential to inverter over-sizing. If an inverter is under-sized, this should happen within certain parameters – which accredited solar installers will be familiar with. Get a free comparison of solar & battery quotes from installers who operate in your area!